Everywhere you go there are people selling crabs. 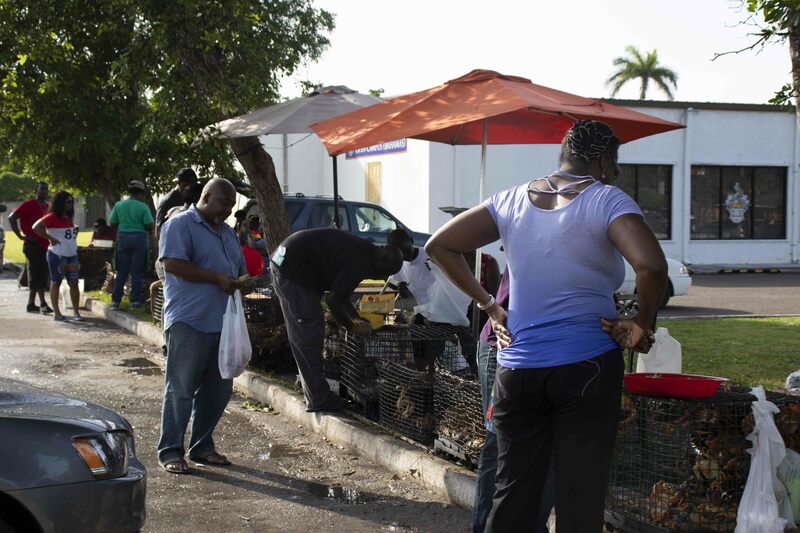 Established vendors place crates next to their stands, but even people without proper stalls have set up little shops. 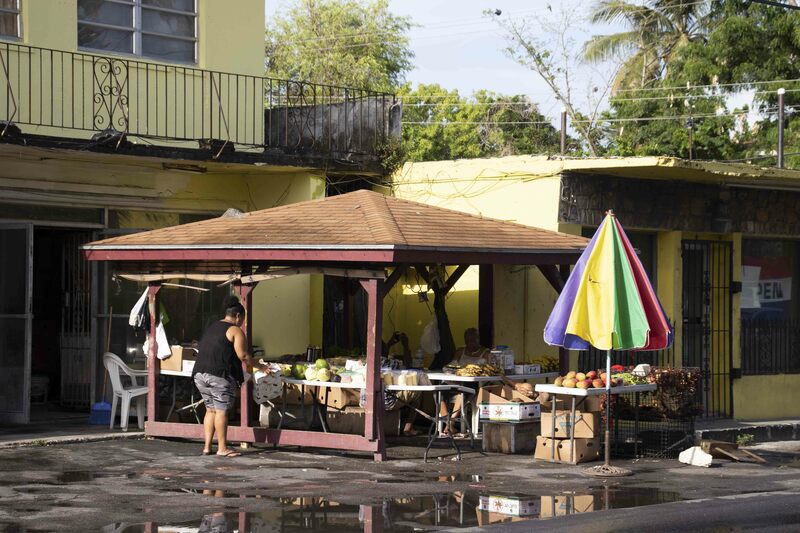 They set their crates on sidewalks or the edges of parking lots, and sit next to them in folding chairs. 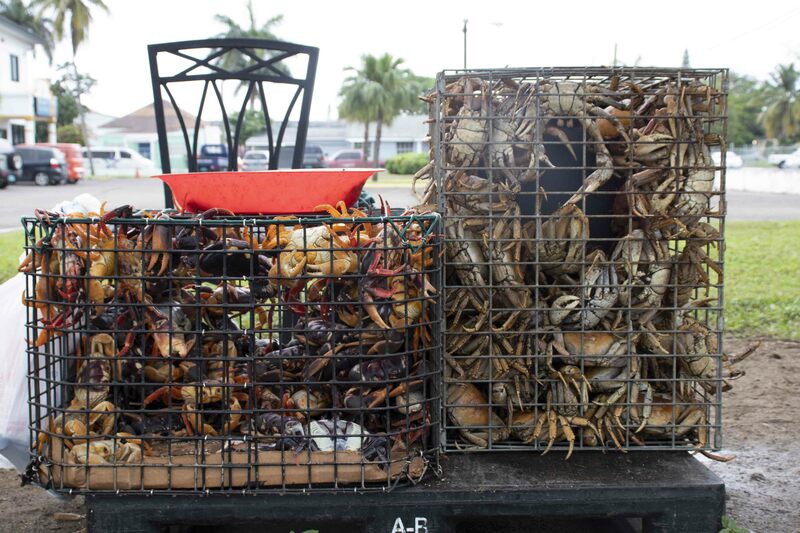 Our local crabs are land dwellers, and there are two kinds: white and black. They have to be housed separately because the black crabs, smaller than the white, would get trampled otherwise. As you can see, black crabs are really pretty! They can be purple, golden yellow, scarlet, orange or navy, with different nuances of colour in between. Since crabs are scavengers, we fatten them up and clean out their systems before we cook them. They’re fed bread, raw rice, watermelon rinds and other fruit and vegetables for a few days before we feel comfortable eating them. My favourite dish is baked crab, where the flesh is mixed with breadcrumbs and spiced with onions, thyme, a smidge of tomato paste and goat pepper. This mixture is cooked and served in the body cavity. It’s spicy, savoury and a bit greasy from the crab fat. Yum! Other popular dishes are crab n’ rice, crab soup and crab n’ dough. Buying crabs is pretty simple. You pull over whenever you see some on the road, ask how much they’re going for, then point out the ones you’d like. Crabs with big biters – what we call the pincers – are always popular; sometimes people want only females, or males. Female crabs are sweeter, and may have eggs which also enhance the pot. Male crab bones and biters are usually bigger, and they also typically have more fat – which people go wild for – than the female crabs. Most vendors wear gloves to carefully pluck the crabs out of their cages, although I met this bold woman named Ella last week who said they only slow her down. She reaches in bare handed and picks through the crabs like they’re potatoes! 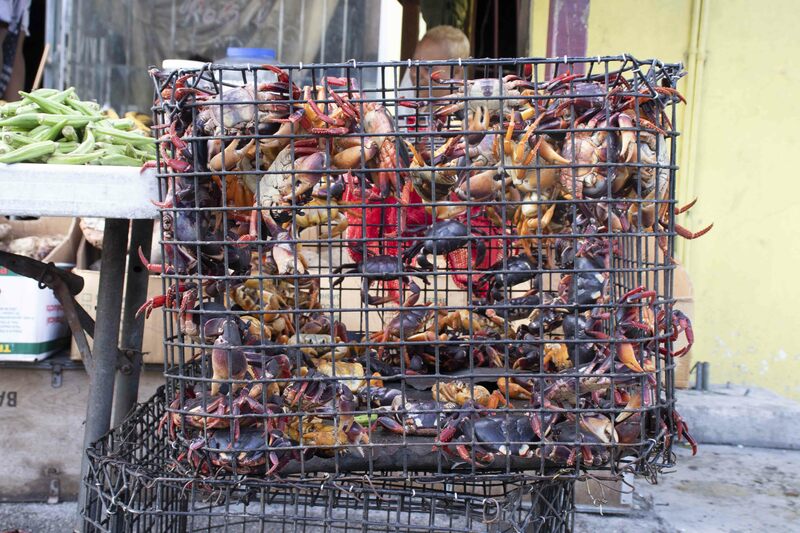 Let me be clear – the crabs are alive in their cages, crawling around on top of each other, and will bite, or pinch, your hands without a thought. They’ll run out of the cage too if they can, and they’re fast. If one escapes you have to run and catch it before it sprints away. Because of all this, the crabs’ limbs and biters are broken off at the time of the sale. It happens very quickly, snap! snap! though to be honest, it makes me wince and I hope they don’t feel pain. Thus disabled, the body and biters, which also have meat in them, are bagged and the limbs discarded. 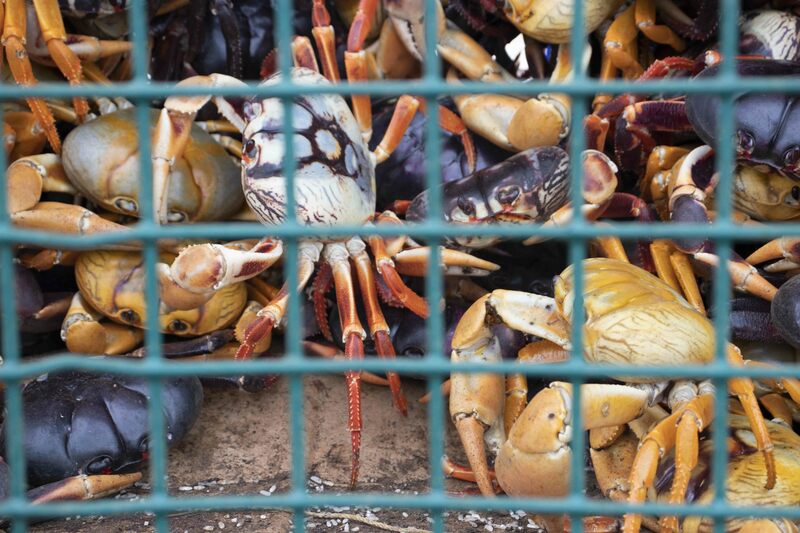 Crab season is short, so for the next few weeks everyone will be eating their fill. 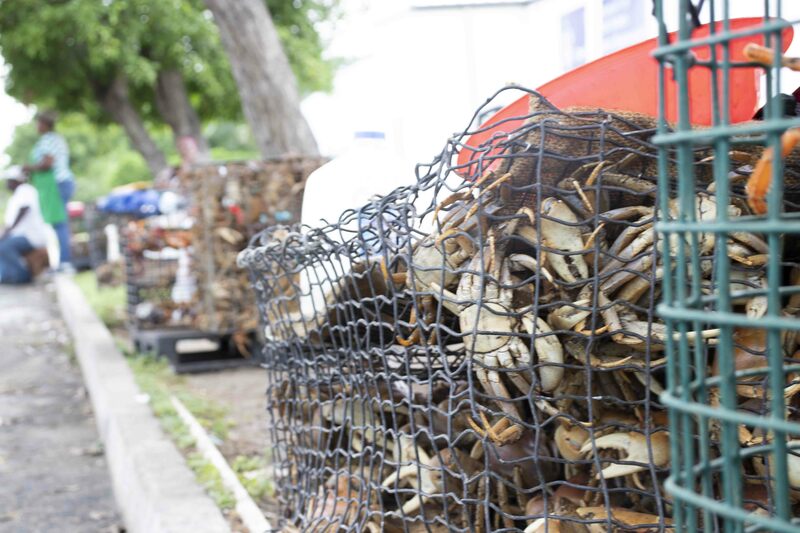 Last weekend was the annual Crab Fest in Andros, our largest island, famous for its crab population. I’ve never been, but I’ve heard it’s amazing and maybe one day I’ll get to experience it myself. Is there any delicacy in season where you are now? What meals are you looking forward to eating? On another note, things are going to be slower around here for the next several months – if the last month hasn’t been any indication. I’m working on a project that’s taking up pretty much all my blog time! Creating content for this space has been a lot of fun though, so I’m hoping to at least pop in with photo essays every now and again. Poincianas are blooming, the air smells sweet with sapodillies and the ocean is as heart-stoppingly beautiful as ever. Cheers to summer! This is utterly beautiful, and so fascinating!!! I can never get enough crab, so all these dishes you described sound heavenly–especially that baked crab! Thanks so much for sharing this, what a lovely photo essay. I’m glad to hear there are more coming, but wishing you luck with your project!